Google announces that Play Movies is now available in 4 more countries including the Philippines. This expands the Play Store’s core products in the country – which now include gaming apps, non-gaming apps, and books. While most Google announcements usually arrive on a journalist’s desk with a press release, this probably does not need one. When I opened the Play Store earlier to look for a game, a large banner was in front of me – telling me that I can now buy movies on the Play Store. Google Play Movies is exactly as what the name says- it lets you buy movies for you to play on your Android device. Whatever you buy on the desktop version can be played on your Android phone or tablet. It lets you even remotely download the movie from your desktop to your Android phone. This is similar to how you download apps. If you choose to install an app on your phone through your desktop, that app will be installed on your phone automatically so long as it is connected to the Internet. 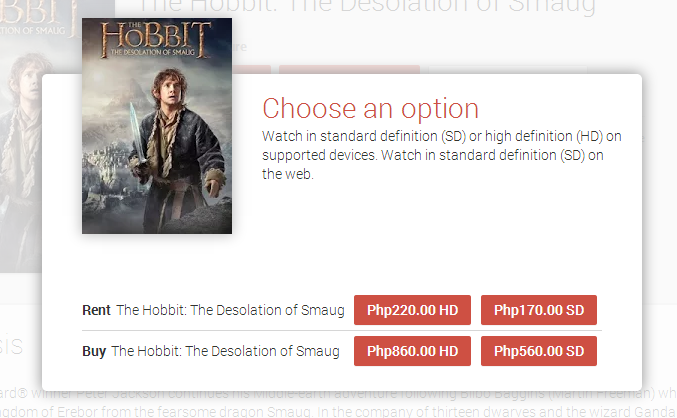 When I clicked on The Hobbit film, I found that the original price listing is what you will pay for renting the film. As seen below, if you want to buy the film, you will have to pay 560 Pesos. Note that the prices are different for every film. After all, not all films are created equal. After clicking the buy button, two more pricing schemes will appear. It appears that there are also options for HD and SD. Buying the film on high definition will of course mean you have to pay more than buying SD. Along with the Philippines, there are three countries where Play Movies was launched simultaneously during the weekend – Uganda, Switzerland, and Belgium. Google Play Movies is now available in 63 countries. It is very interesting to note that the service is only available in 6 Asian countries – including Nepal, Hong Kong, and Japan. In other countries, TV shows can also be downloaded and/or played in Google Play Movies. That feature is still only available in 4 countries – including the US and Japan. Another important Google Play feature that is still not available in Southeast Asia is its Music-streaming service. Thankfully though, the region is host to various local and international music streaming apps – including Spotify and Deezer. When this service becomes available, it is interesting how many Android users in the region will switch to Google’s own music streaming service in the future.